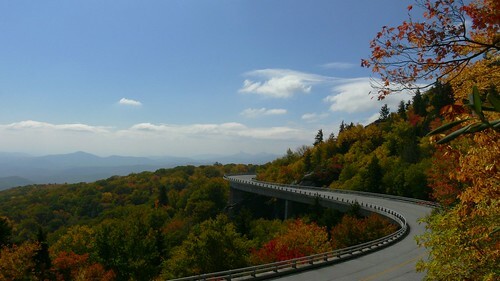 the Linn Cove Viaduct spans one of our world's oldest mountains. The modern marvel was designed with the intention of preserving this precious land. It was completed in 1983 at a cost of almost $10 million dollars. The viaduct spans 1,243 feet and contains 153 segments weighing 50 tons each. I never took the time to stop and actually admire the structure. This fall, I wanted to change that. We decided to take the trail that starts at the end of the parking lot at the visitors center. This trail gives you the amazing opportunity of walking beneath the behemoth. I began to realize all that this bridge represented. and they found a way to make it happen. Anyway, it was crowded, jam packed with people crawling everywhere. We were lucky to find parking spaces. The above photo was taken between cars whizzing by. Cody and I worked as a team, he was my lookout! This is a very common shot taken of the viaduct. What a breathtaking photo.. and amazing facts. My eyes are dancing with those curves. Beautiful! Oh wow! Gorgeous! I want to go driving there! Beautiful colours of the trees changing and the curves in the viaduct. trust me you and Cody take a look at this just down the road from you. Ha Ha. Sara My daugther was at this place in march with her family . please enjoy. it's a video. Wow. Just wow. The photo is breath taking, and it was really interesting to read about the viaduct which I wasn't aware of. I'm so glad you participated this week and hope you continue to do so. You take AMAZING photos! wow ~ I learn so much from you ~ photo is amazing! We were there last summer and I don't remember seeing it. Thanks for the great post. Beautiful capture. we travelled this on vacation a few years ago...and it was amazing and not even fall where the leaves were so pretty. the kids were even amazed and that means a lot! thanks for the pic...great shot! I grew up in Boone when the "missing link" was the talk of everyone. No one believed they would really build the viaduct. And what a sight it is. I love this bridge, i love it's lines and it curves against the fall backround! Wow. That is a breathtaking photo. I feel like I just took a trip there. Thank you for the explanation behind it as well. Well worth the investment, in my point of view. That's kind of like the stretch of I-70 in the canyon before you get to Glenwood Springs--the structure really preserves the beauty of the canyon and the Colorado River. Great photo! Thank you for posting this. I love to see places on these blogs that I have never been. Thanks to your hubby for helping you get the shot! Wow, fall colors are beautiful too! that is really nice, I happen to bump here and I think I would never leave! Just spectacular! I love all the facts to go with the photo! Thanks for sharing. Oh my Lord that is GORGEOUS!!!! This is breathtakingly beautiful!!!! I had to google where this is because I was not familiar. Awesome picture. What an amazing piece of man made artwork. And the colors are fantastic. I miss fall color changes, we don't get them much around here. Wow! That is gorgeous. The bridge and the scenery look unhindered by one another. Did that make sense? You know what I mean. What a breath taking view. I'm glad you had a look-out and didn't get run over. BTW I don't actually remember 4th grade, I just taught it (or close to it) for 30 years. That's why I know what the 4th grade teacher said. Ask me what I had for lunch yesterday and you'll get a blank stare. Oh my, this is one of the most beautiful photos I've ever seen! Wow! The curve of the road and the leaves and the mountains in the distance. What a shot! I am soooo going to have to visit your part of the world someday.... it looks beautiful, and you describe it so wonderfully!!!!! A truly fantastic photo. I can alomst smell the fresh air. Gorgeous!!!!!!!!! That really IS breathtaking. No other word for it. It still amazes me how these structures are built. I love how they preserved nature! beautiful area, and what patience to get such a good shot without cars! What a beautiful way! Gorgeous. oh wow - that is beautiful! I really love this photo. The cloud form is almost like an old airplane. Wonderful. I'm really glad you posted about this because it was all new to me. It's absolutely beautiful, WW. Wow! You did it again like a professional photographer/writer. The photo makes you feel you're actually there and experiencing the breathaking view of the magnifecent engineering marvel hugging the mountain with it's colorful trees. LOVELY - I'm going there in a WEEK - can't wait! !